Our theme (Oh yes, there's a theme! And the ka-cornihan officially starts now...) is an Enchanted and Romantic wedding with a banquet under the stars with the soothing waves of the sea serenading every bite and munch. We will do our best to pull off our dream (more of mine truthfully) wedding. I even have started my nightly "devotional" of praying among other wishes that the sun will be shining, clear skies, no trace of rain whatsoever on our wedding day :-S Wish us luck! We asked Mall to capture our magical moment in Scotland. 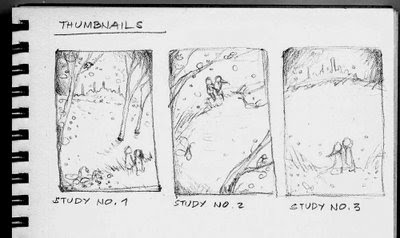 The next day she sent us her sketches – concept studies for us to choose from. 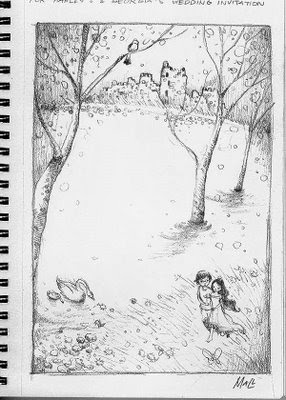 Front ground: you both walk together in a fresh green grassfield just like River Ness with glowing birds, orbs, swans and little flowers. Middle ground: that's a gradient blue - violet river along the River Ness with trees, branches and cute singing birds. With flowing falling dramatic leaves. It would be great to put fonts / info on the river. Background: That's a classic castle just like Scotland Highlands. The sky might be sunset or night sky with the glowing castles. Mall also studied our expressions by digging into our countless photos in our Multiply sites. She came up with these Little Prince-esque close-up illustrations of us. We had a hard time choosing because we adore all of them! But we had to and we picked out Study No. 1. Here's her final sketch for it. WOW. I am like a wood nymph being chased and wooed by a handsome mortal nerd (?). Ang haba ng hair ko, parang nagpa-digital perm... I love it!